Firefighters monitor flames during a burnout operation Monday south of County Road 202 in the Hermosa area. The burnout removes fuel from the 416 Fire, which was last reported at 22,130 acres and 10 percent contained. HERMOSA – The ominous plume north of Durango churned for an eleventh day Monday, putting up periodic puffs of black smoke as the blaze found pockets of thick vegetation – some discovered by natural fire progression, others from burnouts, in which firefighters set their own fires to starve the 416 Fire of fuel. Dozens of hand crews built fire lines around homes, removed vegetation and conducted burnouts on the south side of County Road 202 near Hermosa. The burnouts require care and precision: Fires are set to various parts of a hillside and allowed to run into each other as they move up the mountain. It is a controlled process with fuels removed piecemeal, thereby preventing a massive inferno. Meanwhile, dozens of firefighters stand guard around houses looking for any hot embers that may fall and start spot fires. They spray water on landscaping and structures. Air resources keep watch from the sky. It can be an eerie scene. Neighborhoods are evacuated, emergency lights are flashing, firehoses are sprawled out on roadways, huge vats of water sit ready, some residents leave sprinklers running. Ash falls from the sky. Despite the stark landscape, firefighters on County Road 202 were treated to a rare sight Monday: A black bear darted past them, perhaps in search of more suitable habitat, perhaps frightened by all the firefighting activity. The 416 Fire had grown to more than 22,130 acres as of Monday morning – the most recent estimate available – and remained 10 percent contained as of Monday night. More pre-evacuation notices came Monday – issued for 127 homes along County Road 205. The pre-evacuation includes the east and west sides of County Road 205 from the intersection with County Road 204 to the south and the Falls Creek subdivision to the north. Evacuation orders remain in effect for 2,156 residences. The U.S. Forest Service announced Sunday it intends to close the San Juan National Forest. The closure is expected to take effect Tuesday. Also on Tuesday, La Plata County government plans to enact Stage 3 fire restrictions, and the city of Durango will consider closing trails and open spaces in city limits, including Animas City Mountain, Carbon Junction, Dalla Mountain Park, Horse Gulch and Overend Mountain Park. Shawn Bawden, a spokesman for the 416 Fire, said in a news release Monday night that the west side of the fire will continue to grow as it moves into heavier fuels, but the fire in this section is behaving as predicted. Near Hermosa, firefighters are using burnouts to build a line from the cliff face near Hermosa Creek southward to Tripp Gulch. This preburn will starve the fire. 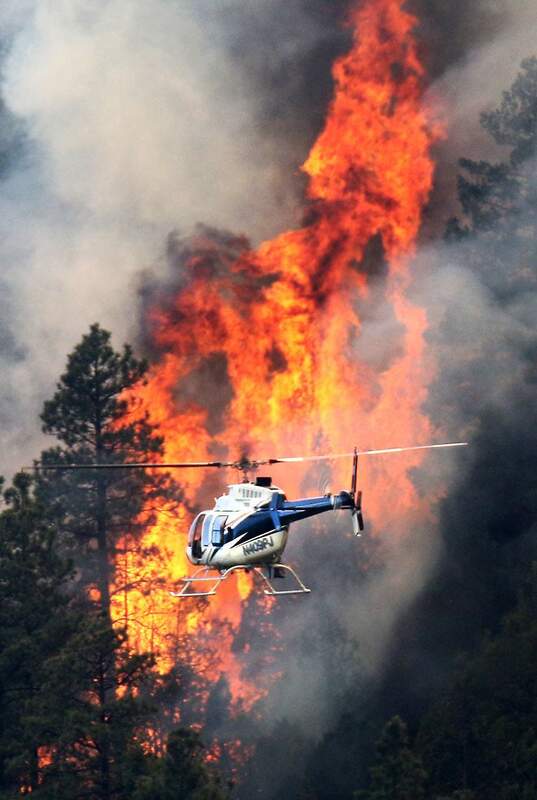 Helicopters drop water during burnouts to lessen fire intensity. Smoke from these operations were putting up much of the plume seen from Durango. Burnout operations aimed at structure protection will continue into the early hours of Tuesday morning. The line around Purgatory Resort is complete, and this area is prepped for burnout and structure protection if it should be needed. At the northern end of the fire, some water bucket drops were used to cool fire on Monday. Overall, fire behavior was light in one section of the northern fire, and there was no fire activity in another section. Along U.S. Highway 550, crews are mopping up around burnout areas and assessing for any further needs. The Forest Service brought in a DC-10 Tanker, known by firefighters as a “VLAT” – Very Large Air Tanker. Bawden said the DC-10 is one of the largest air tankers in the country. 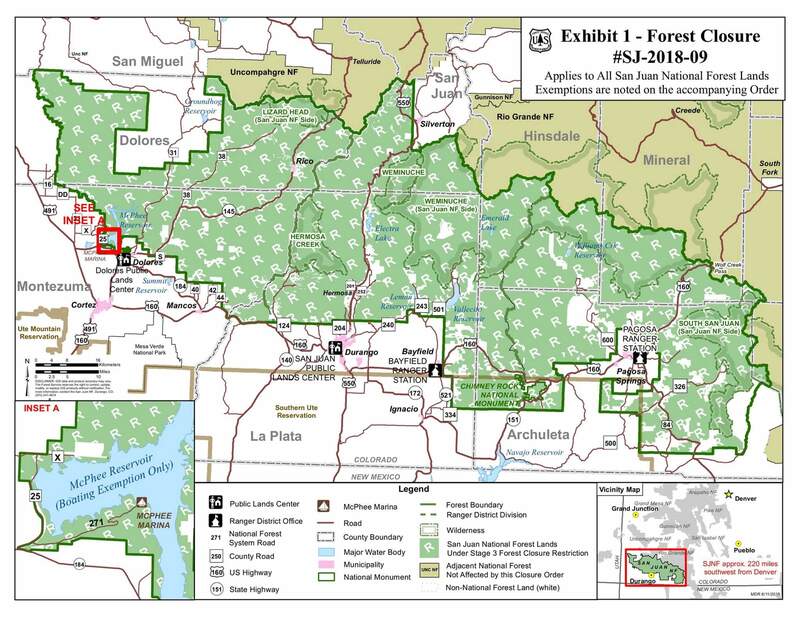 The San Juan National Forest planned to implement a Stage 3 fire closure Tuesday, which prohibits most entry into the forest. A hint of rainThe National Weather Service in Grand Junction includes a chance for precipitation starting Thursday night. From Thursday night to Friday, there is the possibility for isolated thunderstorms. Unfortunately, the weather system could be dry and produce dry lightning – serving only to increase the wildfire danger, said Mike Charnick, a meteorologist with the National Weather Service. Saturday and Sunday also hint at rain and cooler temperatures. Over the weekend, Charnick said it is a safe bet that most of Southwest Colorado will see moisture, at least enough to wet the ground. Higher terrains are more favored. Juliette Ambler led about 30 people in Buckley Park in five minutes of silence to pray and meditate for rain. Katherine Reynolds, one of the rain-seekers, suggested everyone in Southwest Colorado focus their energy on thinking about rain twice a day at 4:16 a.m. and 4:16 p.m., based on the fire’s name, in an effort to conjure precious precipitation. “Who knows what will happen, but at least it will relieve people’s tension for two minutes,” she said. 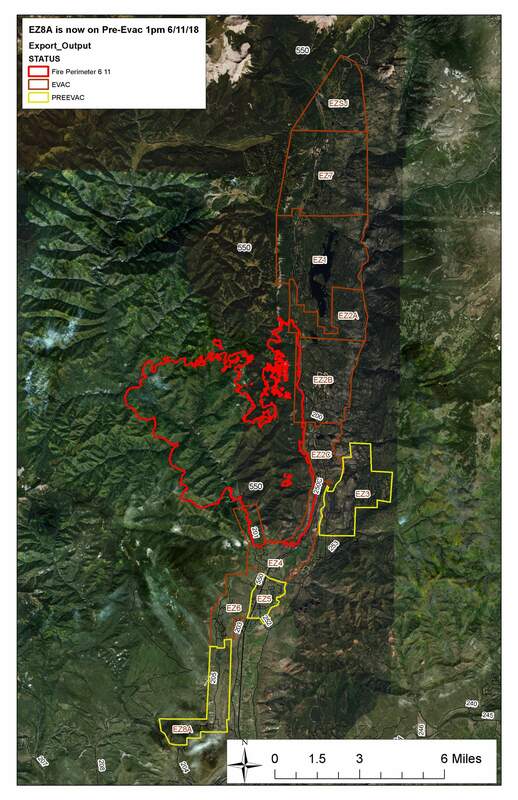 This map shows areas evacuated and on pre-evacuation notice for the 416 Fire. But Tuesday’s conditions will be tough for fire fighting. Tuesday will stay bone and dry with a high of 85 expected at the 416 Fire and a high of 81 at the Burro Fire. Relative humidity remains as low as 6 percent in both locations with winds gusting up to 25 mph after 1 p.m.
No homes lostFirefighters once again held back the 416 Fire from homes in the Hermosa area. Bawden said the fire started moving south toward Hermosa around 5 p.m. Sunday. A helicopter drops ping pong ball-like fire starters on the south side of Hermosa Creek as part of a burnout operation Monday south of County Road 202. The burnout removes fuels from the 416 Fire. Firefighters use the technique to help control the fire and prevent loss of structures. Within an hour, the fire advanced a mile and was within a quarter mile of homes. On the ground, firefighters used direct attack strategies, which included burnouts. 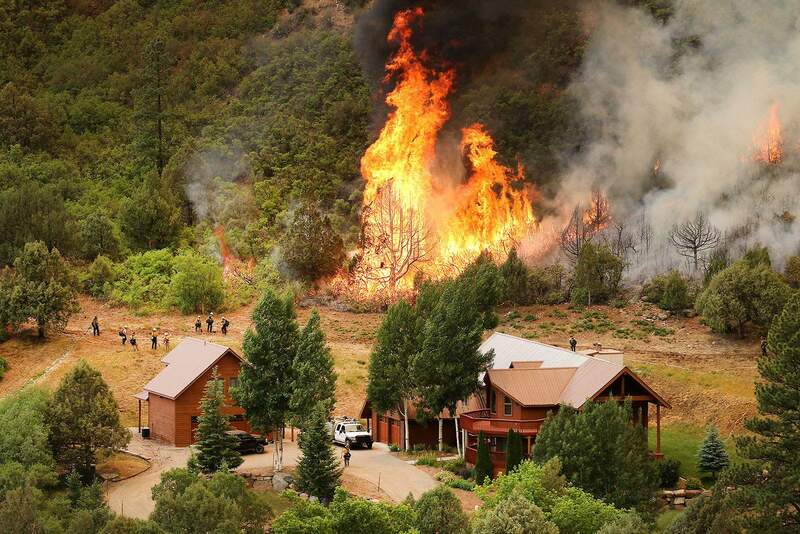 As of Monday night, firefighters have managed to protect every home threatened by flames. Don’t be a lookie-loo!U.S. Highway 550 was closed all day Monday, from mile marker 32 to 64, which is from Cometti/Mead Lane to the top of Molas Pass. “Don’t be a Lookie-loo!” – was the message from the Colorado Department of Transportation. CDOT urged people to steer clear of the south closure point on U.S. Highway 550 near Hermosa. Stopping, parking and standing outside of vehicles along the highway is not permitted. The speed limit is reduced to 35 mph. Eight helicopters were also available in addition to at least two air tankers and the VLAT. The Burro FireThe Forest Service reported that the Burro Fire, which started Friday, has grown to 2,684 acres. That fire is about 12 miles from the 416 Fire in the San Juan National Forest. It is zero percent contained. A Type 1 incident management team that took command of the 416 Fire over the weekend also assumed management of the Burro Fire on Monday morning. The main body of the Burro Fire, named for a nearby mountain, is burning in steep spruce and fir 5 miles up the Bear Creek trail on the south side of the canyon, but embers have triggered spot fires on the north side of the canyon. About 130 wildland firefighters are on scene at Bear Creek. Herald Photo and Video Editor Jerry McBride, Herald Staff Writer Jonathan Romeo and The Journal contributed to this report. 416 Fire on June 11 A burnout operation took place Monday, June 11, south of County Road 202 to reduce fuels around houses in front of the 416 Fire. A burnout operation took place Monday, June 11, south of County Road 202 to reduce fuels around houses in front of the 416 Fire.